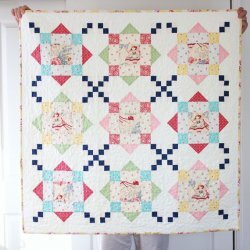 In this cute and easy quilt, Amy uses fabrics designed by Robyn Pandolph for RJR. You'll cut squares and rectangles to create the blocks for this pattern, which are about 12 1/2 in. square. 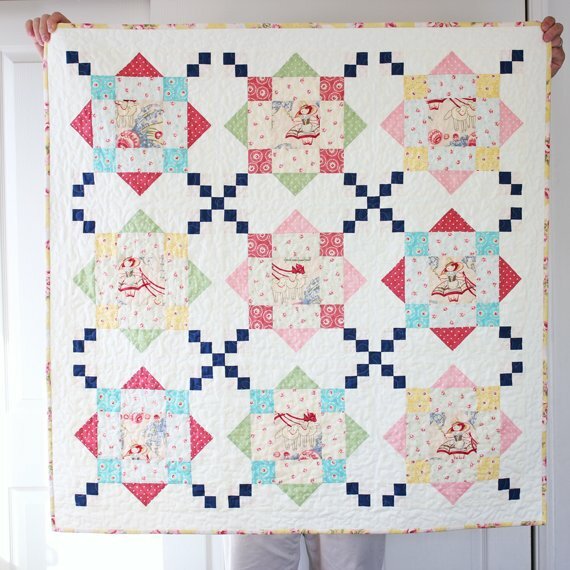 Be sure to enlarge the quilt image so you can see the fabrics featuring Little Bo Peep and her sheep! "I had fun working with Robyn Pandolph's new Bon Bon Bebe line, [from RJR fabrics]. It's a charming collection of sweet florals and darling prints. And because I'm on a bit of a pink/navy kick I couldn't help adding in some dots from Robyn Pandolph's Home Essentials line, and RJR cotton supreme solids (love these... I used Linen White and Denim)." "And what's best is that it's super simple and each block goes together quite quickly."